Jamaica’s capital, Kingston will came alive during the celebration of the 2015 Caribbean Fashion Week (CFW) which took place from June 12th to 14th. The most important event of the Caribbean fashion celebrated its 15 years with the 35th anniversary of Pulse, the largest and most recognized international modeling agency in the region. Epson, a world leader in imaging solutions, was present with the F Series and took the opportunity to demonstrate its innovative side, like the excellent quality and benefits of the new generation of digital sublimation printers. “The F-Series printers, such as the F6070 that we displayed, guarantees unpre-cedented levels of performance in the textile dye sublimation market”, highlights Suyapa Alvarez, Latin America Sales Representative. During the fasion feast, participants could visit and see up close the newest Epson printers in the lounge of the CFW Exhibition Hall. 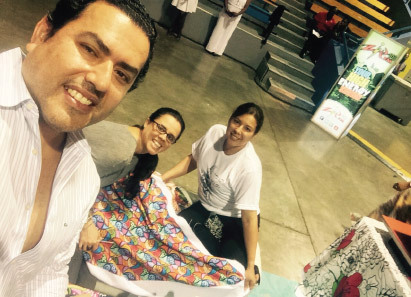 “Digital dye-sublimation technology is a relatively new trend in the industry, the audience could meet and educate themselves about how extraordinary this modern method of transferring incredible designs into textile is”, exposes Suyapa Alvarez, Latin America Sales Representative. Epson SureColor® F Series printers offer fashion designers and textile an accessible way to materialize their ideas and inspirations with unsurpassed quality that distinguishes the brand.